The way we deliver Live Production is changing. Not only does it require the best technology, crew and equipment, it also relies on the most cost-effective solutions. And while HD is still the standard demand for Live Production with 3D adding that extra dimension, a step-change in quality has opened up with the advancement of stunning 4K Live. 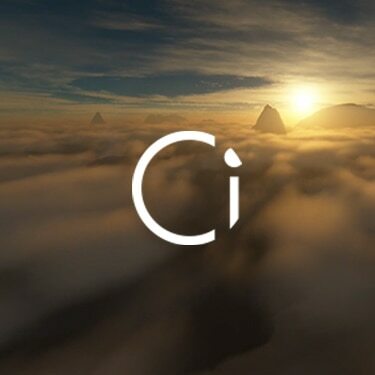 Equally, IP technologies offer new and affordable ways of capturing and distributing content. Whatever your Live Production requirements, we offer world-class, cost-effective solutions with that distinctive Sony stamp of quality. Let us design the best Live Production solutions for you. All our solutions are tailor-made to your requirements, and have been carefully developed to combat common constraints like space limitations or varying venue infrastructures. We’re extremely flexible. Whatever your market or budget, we can work with you on bespoke, cost-effective solutions that have been designed for you alone. from HD/SD to 4K, and 3D to AV over IP. Real-time IP production technology integrates IP network technology and HD-SDI, the standard for HD video transmission. It enables video, audio, reference signals and control data to be transmitted between devices using a single network cable. Multiple high-resolution video and audio, including HD and 4K, can be synchronously transmitted to multiple points, while the source video can be switched smoothly with no switching noise, resulting in a dramatic improvement in the efficiency of video transmission between the field and the broadcast station. Sony has developed AV over IP Interface – enabling network-based video transmission and synchronous, noise-free switching between HD and 4K video, audio, and meta-data. When it comes to the nitty-gritty of shooting in 4K over HD, there are additional practical considerations to factor in – not least of which is ensuring 4K camera channels can feed into your OB vehicle. With 4K, each camera channel uses up to four inputs compared to a single input for HD, increasing the number of connections to the router, switcher and monitors. Also, 4K records four times as much data as HD, requiring the latest compression technologies like XAVC. With over 30 years experience of delivering award-winning technology and solutions, we understand the broadcast workflow, production and business challenges of live and recorded production applications. 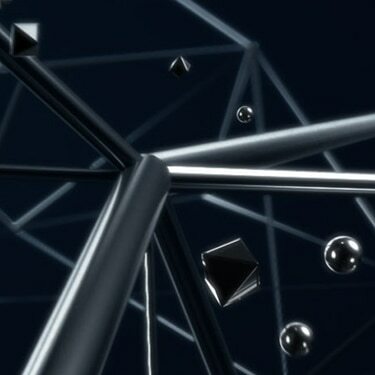 Our 3D production solutions work transparently for engineers, directors and producers. While keeping existing workflows, you can upgrade your studios and outside broadcast facilities to 3D, making 3D production as natural as working with conventional video. Leading Turkish satellite broadcaster Digiturk broke new ground in February when it showed a Galatasaray-Besiktas derby football match live in 4K, sponsored by Sony. The match took place on Saturday, 22nd February, 2014, and was relayed to an audience of just over 100 journalists and VIPs in Istanbul’s W hotel in a 4K point-to-point transmission. The production was created using Sony’s total 4K Live Production solution, capturing and processing in stunning 4K. The production team works in the same way as HD, but has additional functionality from the 4K images, which shows four times the detail of 2K or conventional HD television pictures. The VIP viewers watched the action, shot at 3840×2160 resolution at 50fps, projected through 4K Bravia TV sets and the VPL-VW500ES 4K Home Cinema projector. The match was captured with four PMW-F55 Super 35mm CineAlta cameras, which, together with footage from two up-converted HDC Series HD system cameras, were fed through an MVS-7000X switcher. Everyone was really amazed, they didn’t think it was going to be that successful. For them it was just a quality issue, but when they saw it they found something different. You could see all the detail. In a major live outside broadcast, the ceremony in Rome in April 2014, during which Pope Francis raised Pope John Paul II and Pope John XXIII to sainthood, was transmitted live in HD, 3D and in 4K Ultra HD. 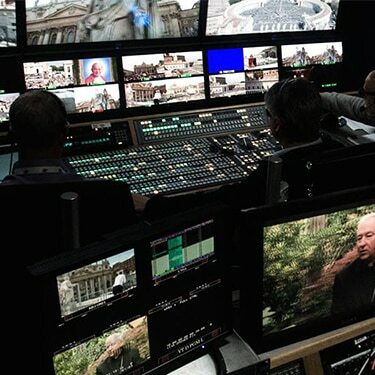 Centro Televisivo Vaticano (Vatican Television Center; CTV), with facilities partners DBW Communication and Sony, produced the two hour April 27 broadcast from St. Peter’s Square, Rome, in a first of its kind parallel production. The event was also shown on Sky Italia. The 4K piece of the production proved another valuable demonstration of the power of Sony’s 4K Live workflow. Feeds from six PMW-F55 cameras with CA-4000 optical fibre back-ends and two wireless HD camcorders up-converted to 4K, were encoded and distributed as four 3G HD-SDI signals by Globecast from DBW Communication’s production truck to a Eutelsat satellite. It was then beamed back to the Vatican’s Paolo VI suite for viewing on a super-size 4K Bravia TV set. As well as the F55s and HD camcorders, the MVX-7000X video switcher in 4K configuration, a 30-inch professional PVM-X300 LCD 4K monitor system and the PWS-4400 4K server were used to record this historical moment. A key goal of the event was to further explore how different production scenarios work in practice by integrating different formats. The three directors for the 3D, 4K and HD productions were able to access feeds from one another. HD could be up-converted to 4K, and the 4K could be offered as a down-conversion to HD. The 4K image could also be ‘cut out’ (zoomed into) and offered to the HD production since a 4K master offers a better quality HD image. Ultra HD gives incredible detail and a real emotive quality. Sony broke new ground when it helped Peter Gabriel create a 4K recording of his Back to Front: So LIVE tour at the O₂ in London in the autumn of 2013. One of the biggest live multi-camera 4K recordings to date, the concert was shot on Sony PMW-F55 cameras by production company Done & Dusted and ERP Productions supported by outside broadcast company CTV. In terms of workflow the F55 cameras were used in combination with Sony AXS-R5 recorders with the highest quality RAW footage recorded onto high capacity ASXM cards while SxS memory cards were used to record HD proxies, with hire company On Sight providing DIT services. The cameras were linked in HD back to the truck via Fibre with that footage used for the live cut big screen version broadcast at the O₂. It also acted as the guide cut for the 4K version. Morris adds that the other big advantage of 4K RAW capture was that the editors had the best possible picture quality for post production, which meant that much more could be done with the images. “In the edit, the RAW footage gives you a huge amount of creative control to manipulate and adjust the images and grade – which is the best way to produce a master which will stand up to scrutiny for the next 25 years,” says Morris. These are difficult lighting conditions, but with the F55 you can get two and three f-stops over other cameras and can get really good pictures. 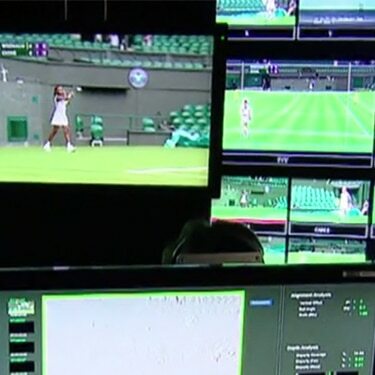 For the very first time, the Wimbledon finals were broadcast live in 3D thanks to Sony. You can see the results live on the BBC HD channel or at selected cinemas in unbeatable 4K. Tennis in 3D is an incredible experience because you really get to see the live action, the emotions of the player, the atmosphere. Sony has built a mammoth 28-camera OB vehicle with four expandable sides for Di Bi Technology, the Italian OB provider for The X Factor and many Italian football matches. The vehicle – called DiBi 11 – was designed and built by Sony and has Sony products at the core of its complex operations. The kit list for Di Bi Technology’s truck reveals the design and implementation of the van has been put together to provide a truly ‘best of breed’ outside broadcast service. Aside from being wired for almost 30 cameras, it’s built around the high-end, 3G-ready Sony MVS-8000X switcher and OLED Trimaster EL professional monitors. 21 dual-format HDC-1700 HD system cameras were supplied with the vehicle, all with high-spec HDCU-2500 3G camera control units. Di Bi Technology also received two HDC-3300 super-slow-mo cameras. “By standardising on the brand of camera manufacturer we can share cameras with other trucks and they just connect up, slot in and work. Camera control is easier this way too – you know you can buy a product from the same brand and it’ll be familiar to you,” explains Naldoni. By standardising on the brand of camera manufacturer we can share cameras with other trucks and they just connect up, slot in and work. Béla Molnár puts the Anycast Touch through its paces on a four camera, live music event and showcases key features, explaining why it’s his first choice for producing live content. We live streamed the complete full length gig… the major problems are usually the audio gets out of sync, dropped frames, streaming errors; and I must say not once we had a problem. Next-generation management, real world affordability. The future of broadcast news with Media Backbone Hive.